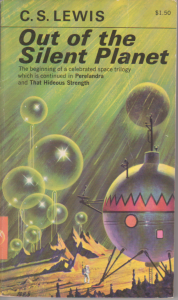 I want to pack myself into a one-man spaceship and rocket past the dead void of space surrounding this cursed Earth and into the warm, vibrantly colored expanse of the Universe that C. S. Lewis describes in the first novel of his science fiction trilogy: Out of Silent Planet. Once there, I would paddle my little ship about till I find where the constellation Orion hangs out. I am absolutely convinced that he is a living, breathing entity, and I would like to sit down with him and hold a very long conversation. To be fully honest, the Orion constellation has been the only true constant in my life. No matter where I am in the world, when I look up into the purpled midnight, I spy the three stars that comprise his belt and I know that he is hovering over all that I hold dear to me and guiding me in any direction that I choose. Those three stars are my markers for home, self-pondering, memories, curiosity…He’s my beacon. So, I’d love to ask him a few questions about destiny. Surely he has to have answers since he has been my midnight guardian these last twenty-three years. I’d be tempted to ask him if he could see any outcomes for my future. Perhaps that is a silly notion though because I may want to know my future now, but will it truly benefit me to have such knowledge? In fact, is my future even fully certain? Is it represented as a fixed destination or does it change with each decision I make? I prefer to think the latter, and I’ll tell you why. I don’t like the idea that I have no control over my Fate. Why should the stars alone decide where my life will end and the paths that I determine to get there? Exactly. Doesn’t seem fair, does it? So I’ve pretty much said…” Nope. I’ve got this one, Orion. Just keep twinkling up there, and I’ll figure this out on my own.” But before I came to make such a bold statement concerning my life, I was extremely fascinated with astrology. Now, I’ve never been a fan of horoscopes and psychics or whatnot, but there was just something that caught my attention when it came to astrological signs. PLUS, I believe in God, so I know that he has knowledge of where I’m headed and he created the stars, right?, so they have to hold some weight in my life. He said, “Observe the Heavens.” Welp, even if I don’t put a whole lot of bunk into astrology, it is fascinating to read about. My star sign is Scorpio, so I did a bit of digging into what that exactly means for me. I found this killer book about birth dates and whatnot at my local library sale! It was massively thick, and I pretty much stole it for two bucks. In a retail book store, I’m sure it sold for close to fifty bucks. Anyways, I checked out my date and read up on supposedly on my predicted personality. I have this odd habit of quirking my right eyebrow and crinkling my nose to the right when I think something is particularly bogus, and that’s what I did……At first. As I read further, some of it actually made sense and even seemed to fit me quite well. I won’t go into too much detail about what it said since Scorpions apparently like to remain mysterious ;P but one thing in particular stood out to me. The book said that individuals born under the sign of Scorpio are powerful, determined people with vibrant personalities and steadfastness which results in the ability to maintain ultimate control of their destiny. Well hot diggity, that sounds awesome! Especially since I’ve already decided to do that anyways. But you know, this got me thinking (obviously I do this “thinking” thing a lot), and it made me curious whether or not other individuals are fully capable of maintaining their own destinies. The idea ruminated in my brain for some time till I realized that I was basing my thoughts too much on the reasoning that astrology is 100% accurate, which it’s not. Therefore, I can only assume that we ALL are capable of of achieving the destiny we set out for ourselves. Paths do not matter because we will choose multiple throughout our lifetimes. The KEY is not letting others choose our paths for us. There may be God up there who knows our end results, and we may have our guiding constellations, but ultimately, the decision is ours. The greatest gift Bestowed by God to us is FREE WILL. I agree, Amer! Free will is the foundational element of faith. We must CHOOSE to believe and trust, otherwise the choice was never truly ours.